Was I being unreasonable - echeck-in/room type change -- walk? It is not that the guest can't sleep in a double bed, but that the guest booked a King, wants a King, and a King was available and the guest got it. The real "seriously?" is why the process became so dramatic. You seem to have missed my point. Of course they should give the guest what he booked. I acknowledged the problem was at the desk. I'm asking (unrelatedly, actually) why a person needs a king to sleep in instead of a double (if you're not 7 feet tall). And you don't think that demanding to be walked at the hotel expense because you did not receive the exact bedding you were expecting is beyond the pale? You were not unreasonable at all. I acknowledged the problem was at the desk. I'm asking (unrelatedly, actually) why a person needs a king to sleep in instead of a double (if you're not 7 feet tall). And why does someone need a first-class seat on a plane if they are not 7 feet tall? fairhsa and strickerj like this. I really don't understand the people who are saying bed type is not guaranteed. When it is a different type of room with a different rate, surely most countries would consider this a contractual obligation. If you paid extra for a high-floor room and they gave you a room on the ground floor, would you also say that the high floor was not guaranteed? I agree that if the room is booked as '1 king or 2 doubles' then the bed type is not guaranteed. But when bed types are separate categories, then surely it is no different than any other category of room. sstcobra, MSPeconomist and strickerj like this. The frustrating thing is being told “you changed your mind” in the face of proof you did not. This agent has undoubtedly let earlier arrivals have whatever they wanted irregardless of what they booked. People will book whatever is cheapest and then show up and ask to change, leaving people who arrive later hanging to get what they actually booked. Another frustrating thing is the app that lets you pre select a room usually suggests to you not as nice a room location as is available and if you are not familiar with the hotel, you may well accept a room overlooking the roof with massive heating and air equipment on it. I refuse to use the app. If it really matters king or 2 beds, I email ahead or call the front desk to have them block in my room so that I don't get stuck with the leftovers. Indeed, the agent insisting on putting the issue on me in the face of the evidence to the contrary is what escalated this in my mind. Re room selections in the app, I had been told by an insider when the room selection first rolled out that the app (and actually the OnQ interface that most properties use at the front desk) will default to the least frequently occupied room of the reserved type in an effort to level wear of furnishings, carpet, etc. across rooms. The side effect however, is at hotels that pay attention when assigning rooms is that the default option is highly likely to be an undesirable room (near elevator/laundry/dumpster, etc.) since they'd typically avoid booking guests in that room. I'm not sure I buy that room types are not guaranteed aside from what some in this thread are noting. In 15 years with the (H)Honors program this is the first time I've not gotten the bed type I reserved. I think there's also a distinction between the preference shown in my Honors profile -- which is just a preference -- and the specific room type/category being reserved. (e.g. King, Executive, Suite, w/ or w/o sofa bed or refrigerator etc.). Either do I -- if my reservation just showed that I was booking a room (e.g. a "run of house" reservation -- as many third party reservations are, incidentally) I would agree that the preference in my profile for a king bed is just that, a preference and not guaranteed. On the other hand when I'm given the choice between "2 Room Suite-1 King Bed-sofabed" and "2 Room Suite-2 Double Beds-sofabed", among others, with different pricing and the reservation confirmation shows "Your Room Information: 1 KING 2 ROOM SUITE W/SOFA" and doesn't include "escape" language like 'subject to availability' or 'based on our whims'*. I don't see how that's any different than choosing first class vs. economy, a BMW vs. Honda, etc. Sure some people will view them as fungible commodities [I certainly feel that way about rental cars -- 4 wheels and an automatic, I'm generally good. ]; but I don't view hotels that way and I've found I sleep miserably in small beds. Being able to reserve that bed type was my inducement to book at that property -- had they not offered a King, I wouldn't have booked elsewhere in the first place. Incidentally I'm attending a conference in Madrid in May. The official conference hotel [a Marriott] is only showing rooms with 2 twins available, so I'm booked at different property that's about a mile walk where I could get an appropriate bed type. * The closest I come is "Any change to your arrival or departure date or room type is subject to hotel availability and may result in a possible rate change or additional fee. Changes also may not be possible at a later date. 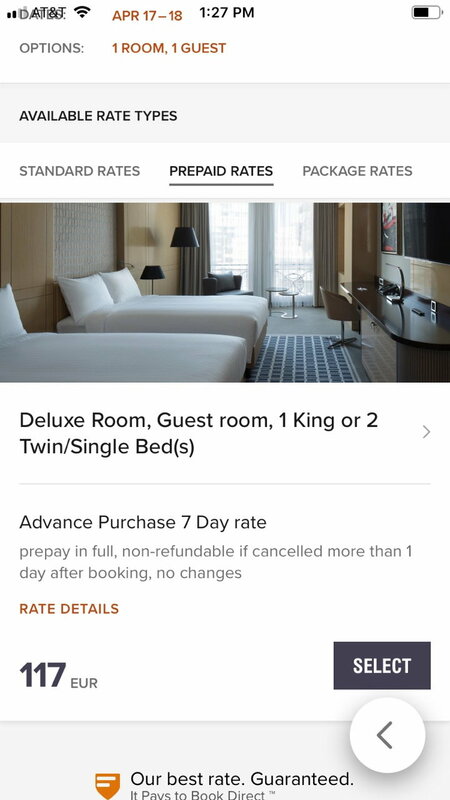 Please click here to see all rules and restrictions"
I agree that if the room is booked as '1 king or 2 doubles' then the bed type is not guaranteed. But when bed types are separate categories, then surely it is no different than any other category of room. Which seems to be the Marriott method and why I don't generally stay there. HUH? With Starriott, different bed types seem to be different room categories, sometimes at different prices for rooms that seem to otherwise be equivalent. The only time I tend to see room categories given as "run of house" on reservations is when I'm part of a large conference block. This is what I usually see with no way to pre-select bed type. Only for Platinum Elite and above and for properties in the US/Canada. I am not Platinum Elite and most of my stays are outside the US/Canada. I manage to select bed type outside of North America. However, I always book on the website, not through the app. First off, I think you aren't reading it correctly. You are using 2 requirements, platinum elite and properties in US/Canada. Only the latter applies. Second, I'm not sure the latter is also correct. I think the difference outside of US/Canada is that the smoking thing is variable. Which I find may be true, but nowadays many Marriott properties are all non-smoking even in other countries. But yes, I can see how in China you would never want to guarantee the "non-smoking" room. Programs: No programs & No Points!!! Of all the things that can happen when you travel, this is near the bottom of the list IMO. No guarantees, and it’s hard to believe you gave this more than a moment's thought. Move on...life’s short and you still had a bed (two of them, in fact). I couldn't imagine caring that much about having a King bed for a night or three. Also you usaully get more pillows and more towels. However I won't begrudge anyone who does. Different strokes for different folks. I wouldn't care that much about the bed type, but I do expect the room that I booked. Similar thing happened to me when I checked in to a Hilton. I selected a king room in the ap. At checkin, just got my key and went to the room. I get there, and it's a different room number than I selected (no big deal), but inside had 2 beds and parking lot view instead of king lake view. I called the front desk, and was told "sorry, we're oversold, no king rooms available, this is the room you booked." I said that was most definitely not true, and was similarly told that I was wrong. I pulled up my res, and called back. Turned out, they checked me in under the wrong name. The FDA didn't hear my name correctly, and never actually looked at my ID. So it was a good thing I put up a fight. Dambus, fairhsa and strickerj like this.